Needs will almost always come before wants. When it comes to Transhumanism, the ability to differentiate the two tends to blur, because a need could also be a want depending on the various methods of achieving a need. There’s the “getting by” need and then there’s the “thriving” need. For the disabled, this dichotomy determines how well they’ll get by in life. If someone loses a leg, then simply getting by could be achieved with a cane, a walker, or even a low-tech prosthetic. However, if this person wishes to thrive in life, then a high-tech prosthetic would be much more preferable, though could also be considered a want rather than a need. For Transhumanism to work, however, I’d argue that the ability to thrive should be considered an absolute necessity. Thus when it comes to the disabled, I believe they deserve the ability to reach post-humanity before anyone else. In all actuality, this is already happening. The U.S. Transhumanist Party will endeavor to open one of these general comment threads per month. This comment thread pertains to the month of July 2017. Would you allow your children to be alone with a robot? I ask not for the children’s safety in mind, but rather the robot’s. As shown in the video provided above, a group of Japanese researchers – from ATR Intelligent Robotics and Communication Laboratories, Osaka University, Ryukoku University, and Tokai University – patrolled a public shopping complex in Osaka using a remotely-operated robot known as Robovie 2. Children naturally being curious, hordes of them decide to surround the robot when spotted. Some were quite nice and simply wanted to play with the robot. However, others felt the need to attack it either by kicking, punching, or trying to rip its head off. What I find most fascinating about this is that, like a child, whenever the robot feels like it’s in possible danger (or, rather, there’s an increased probability of danger) – of which it’s able to do so by calculating the probability of abuse based on interaction time, pedestrian density, and the presence of people above or below 4 feet 6 inches in height – the robot then changes course and brings itself within close proximity of a parent for protection. Robots are, most certainly, coming and will potentially disrupt nearly every major industry in society. However, to ensure their overall safety, it might be best that, whenever a child comes close to one of these robots, a parent should always be nearby – not for the sake of the child, but for the sake of the robot. One might think that this question could be juxtaposed with that of the question of property rights. And, to a certain degree, it would. However, when it comes to robots, we also have to consider the psychological ramifications as well. We deliberately give robots anthropomorphic features given the fact that research has shown, time and again, that, unlike other inanimate objects, robots have the ability to evoke empathetic emotional responses by humans as a result – especially when humans believe those robots are being abused. In other words, by physically abusing robots, one is then potentially causing psychological harm to other sentient entities in consequence. This then raises a problematic situation when simply juxtaposing non-sentient robot rights to that of property rights. Unlike other property, robots have the capability of evoking empathy out of humans. Thus my reasoning for wanting to bring this particular topic up for further discussion. Where should Transhumanists stand – and, in particular, the U.S. Transhumanist Party – in regards to the physical abuse of robots, keeping in mind the potential psychological ramifications that may arise among humans as a direct result? The U.S. Transhumanist Party will endeavor to open one of these general comment threads per month. This comment thread pertains to the month of June 2017. 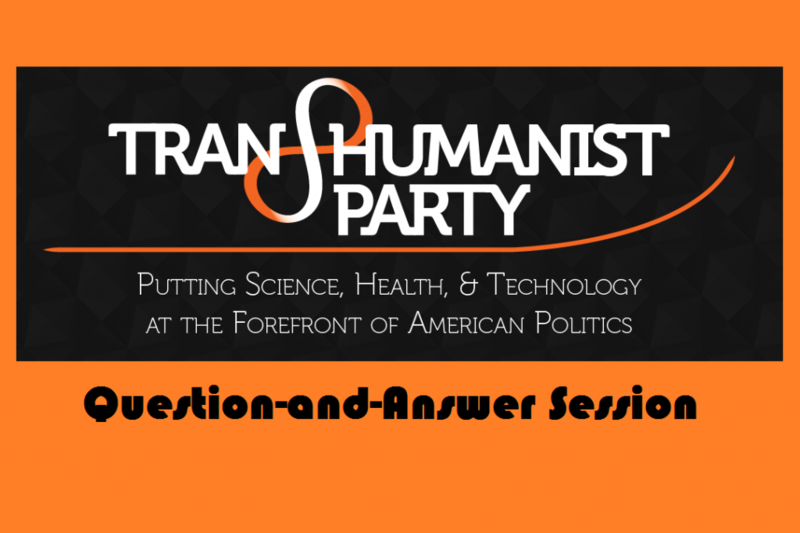 The purpose of this post is to facilitate member comments pertaining to transhumanism and the U.S. Transhumanist Party, which might not specifically fit the subjects of any other post or article on the U.S. Transhumanist Party website. This is the place for members to offer suggestions or converse about any areas of emerging technologies and their political, moral, societal, cultural, and esthetic implications. The U.S. Transhumanist Party will endeavor to open one of these general comment threads per month. This comment thread pertains to the month of May 2017. The purpose of this post is to facilitate member comments pertaining to transhumanism and the U.S. Transhumanist Party, which might not specifically fit the subjects of any other post or article on the U.S. Transhumanist Party website. This is the place for members to offer suggestions or converse about any areas of emerging technologies and their political, moral societal, cultural, and esthetic implications. The U.S. Transhumanist Party will endeavor to open one of these general comment threads per month. This comment thread pertains to the month of April 2017.